Double Haul Guide Service was founded on the principle that the angler deserves more than just an outing on the water. Fishing is an adventure and with each sunrise new opportunities are born. Whether you are a novice angler or a seasoned pro, I promise to deliver quality services as a knowledgeable, friendly guide who enjoys sharing my passion and experience. I invite you to come and test your skills on the wild fish of the Cape Fear Coast, where adventure happens at sea level. Endless angling opportunities await you on the Cape Fear Coast. During peak season "dawn patrol" could have us seeking tarpon and finishing the day casting to tailing redfish. The preferred method of fishing is known as sight fishing. 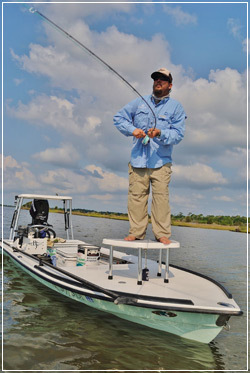 While quietly poling the boat through shallow water you and your guide will see the fish you are casting to, whether sending a topwater plug towards busting seatrout or throwing a fly or jerk bait to redfish finning in the shallows. See, cast, catch. Click here to learn more. We are also pleased to recommend a variety of destinations and guide services to feed your passion for fishing to other salt and freshwater species. So, if you are feeling the tug of wanderlust, check out some of the magnificent fisheries that we can help you explore. Click here to learn more. What time of year is the fishing good? Fishing on the Cape Fear Coast for redfish is a year round pursuit. The season begins in March and peak season begins in May continuing through October. Cast and Blast trips begin in September and run through November. Winter sight fishing for large schooling fish lasts into January. I keep the finest spinning tackle from Lamiglas/Quantum and fly tackle from Scott/Nautilus. I welcome my fly anglers to bring their own equipment. See our recommendations on the "flies and gear" page. All anglers need a NC coastal recreational fishing license, either resident or non resident. See here for more information. Are lunch and drinks provided during trips? Light snacks and waters/soft drinks are provided on all trips. On full days lunch is provided and will be coordinated with anglers needs. If you would like to bring alcohol there's room in the Yeti Cooler, six pack limit. If you are able to be picked up on the water, I will gladly pick you up at your dock, on Figure Eight, Wrightsville Beach, Bald Head Island and other locales.